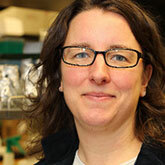 Ann Wolken is the senior graphic designer for UW Medicine Advancement. In this role, Ann develops and executes a consistent, professional suite of materials for all of UW Medicine Advancement’s needs. This includes large-scale events, a semi-annual magazine, proposals, case statements, alumni communication, annual reports and stewardship materials. She enjoys applying her knowledge of creative strategy and branding in every communications piece. Ann has more than 20 years of experience in design and holds a bachelor’s in journalism from the University of Missouri-Columbia. Her goal is to help further communication through the use of design.